Giant 2018 Mountain Bike Talon 2 Size S Blue. Condition is Used.Few scratches but otherwise excellent condition great looking bike. Always kept inside. GIANT XR ROAM MOUNTAIN BIKE 2014. A couple of very minor marks - overall excellent condition. Giant Halfway Brand Folding Bike . Condition is Used. Local pickup only. This bike is in very good order and has a drink bottle holder on the front. 7 Speed gears. We have two identical bikes for sale but you are bidding for ONE bike only. If you require two bikes please bid on our other listing. Giant Boulder Bike. Condition is Used. Local pickup only. Giant Trance1. Mountain Bike. We bought this bike hoping our son would take on my passion for cycling, but were mistaken! It is in great condition, with a few rubs that can be seen in the photos. Carbon drink cage. Evolve XC RaceFace. Giant Trance. Mountain Bike. Giant XC dual suspension mountain bike with disc brakes in great condition. Great quality bike, service with all controls in good working order. 20.5 inch in size. 26 inch wheels. Dual suspension. Disc brakes. Quality forks and rear shock. Pick up from luddenham or Parramatta. Giant Halfway Brand Folding Bike . Condition is Used. This bike is in very good condition and has a drink bottle holder on the front. It has 7 speed gears. We have another identical bike for sale but you are bidding for ONE bike only. If you require two bikes please see our other listing. Condition is Used. Local pickup only from 2171 (south west Sydney region). See pictures for specs and sizing. Scruffs on both levers and rear derailleur. Marks from general use. VINTAGE 1996 21 SPEED GIANT 4130 CROMOLY 26" MOUNTAIN BIKE; SHIMANO; MELB P/UP. 21 SPEED; SHIMANO CRANK SET,GEARS AND SHIFTERS. SHIMANO MOUNTAIN BIKE PEDALS. SHIMANO STX FRONT AND REAR DERAILLEURS. SHIMANO STAINLESS STEEL GEAR AND BRAKE CABLES. CRANK SET AND 7 SPEED GEARS BARELY WORN. Boys Bicycle frame XS wheels size 26. Condition is Used. Local pickup only. Giant Glory 2. Has never been ridden as a downhill bike. I purchased it secondhand from a guy who rode it around the city and I never got into downhill myself after buying it. It is a medium sized frame and in excellent condition. Condition is Used. Bought this bike for my son approx. As a result this bike is still in good condition. Would suit 7- 11 year old. Adjustable seat allows the bike to grow with them. Has a compact wheelbase and very solid construction but not too heavy. Ultegra Hydraulic disc brakes. Ultegra shifters and geared for hills 50/34 and 28 cassette. This bike rides fast and smooth. Bank Deposit Only due to high P/Pal Fees. Australia wide most cities. 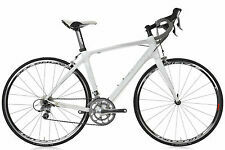 Giant defy advanced 2 road bike. Carbon frame. Size M/L. Bike is in overall good condition. There is a small chip on the top tube however it's asthetic only. Leyzene micro drive front light. Cet eye rear light. Size M/L (Suits rider 177cm-187cm). 2 x bbb water bottle cages. Giant PR-2 Disc wheelset with Giant Gavia AC 1 tubeless tyres. Changed jobs and bike no longer required. Composite fork with alloy OverDrive steerer. The bike is in good working order, serviced and ready to ride. GIANT Enchant Liv Womens 26” Mountain Bike Size M White. Condition is Used. Local pickup only. LOVELY GIRLS BIKE-in very good, clean, riding condition-JUST SERVICED-little use. Has bike stand. Tyres in good condition. Shimano 7 speed Atlas gears (handlebar grip changer). Local Pickup in Caulfield North 3161. - Shimano RS10 Wheels. Giant Upland Mountain Bike with Shimano 21 Speed. Giant Upland Mountain Bike with Shimano 21 Speed.. Condition is Used. Local pickup only. In very good condition. Rarely used. Bike is in very good condition. Photos are part of bike description. GIANT DEFY 1 ALUXX roadbike Large size 55.5cm will suit taller rider, Composite fork, R/Derail 105 gears, triple chainwheel crank, 10 speed 12 - 28 teeth, 105 clipless pedals, saddle bag, full length mudguards, alloy cage. In EXCELLENT condition. Child’s Giant Brand Bike - Suit 3-5yo. In excellent condition. Always been kept in garage. No rust. Training wheels can be removed. Wheel size listed was input by eBay, I could not change. PICKUP BEROWRA. NO COURIERS, NO DELIVERY. 2019 GIANT REVOLT ADVANCED 2. Giant out front Mount Light/Computer/Go Pro. Stem Giant Connect, 8 degree. Brakes Giant Conduct SL brake semi-hydraulic disc, 160mm. Rims Giant PX2 disc tubeless ready. Hubs Giant sport disc, 28H. As new condition. Local pickup only. Saddle: Liv Connect, Upright. Stem: Giant Sport. Brakes: Tektro HDM 291 hydraulic, 160mm. Handlebar: Giant Connect XC, Low rise, 31.8mm. Giant Seek 2 Commuter Bike. Size M Colour Blue This bike is in excellent condition, no marks or scratches, kept indoors. Bought it new in Feb 2018 from Ivanhoe Cycles. Ride is fast and really smooth. The bike came with Schwalbe Big Apple Tyers 50mm x 500c which are still in great condition and I have recently put new Tyers on which are WTB nine line 2.0 x 29ers. Both sets of Tyers are included in the sale. Shifters SRAM via Centro 20sp Shimano M355 Hydraulic disk brakes Pick up from Berwick Vic 3806 No postage offered Please contact if you have any questions. Ladies road-racing bicycle for sale. For commuting, fitness, or just for the fun of it. The bike is light and fast and is a great ride. Bike And Side Cart. Condition is New. Local pickup only. Giant CFR-2 Racer Vintage Carbon Fibre bike. A collectible now, at around 25 years old. Original Carbon Fibre bike one of the first for Giant. Dad paid around $3000 just for the frame when new! Fitted with at the time all the best gear. The best shimano gears and brakes and Italian rims. Size is 55cm Comes with Clip in Shoes Pickup in Traralgon. Giant XTC kids mountain bike, good condition (7/10) slight rusting in the chain and suspension as shown in images. Grips show clear signs of use. Perfect bike for someone to learn on or a ideal bike for a intermediate rider. TCR Advanced SL 2 2016 Limited Edition - Size Small (S). Has the very light Giant SLR 1 DB carbon wheels with great braking. The bike has done less than 1000km, I have the original receipt. The bike is in excellent condition. Vintage Giant bike. fully restored. The rapid rise in popularity of Giant bicycles is a testament to the ingenuity of its Taiwanese founders and the dedication of its succeeding higher-ups. Today, the brand is well-known across 50 countries and has produced over 6.4 million bikes, which has helped promote exercise as a form of recreation. People young and old enjoy riding a good bike, so maybe it’s time to shop around for a Giant bike. boys' Giant bicycles catered to the needs of budding and confident riders alike. The Jr. Animator is a good option if training wheels are his thing. Available in blue, black, and green paint jobs, these are attractive choices for his first ever bike. The included training wheels can come off with a couple of bolt removals when he is confident enough to ride on his own. For big boys, the Veer has a 24-inch pair of wheels, an easy-to-ride frame, and Shimano Revo Twist shifters for a fun riding experience. Little ladies need their exercise too, and girls' Giant bicycles cater to their tastes. Have her tear up the streets like the boys by getting her the Holly 16-inch bike in white and teal for high visibility and equally high cuteness. The teal finish has pink and white flowers along the frame and chain guard, while a chrome-finished pair of training wheels flank the rear wheel for stability. The front has a tiny basket with a flowered pinned to it, perfect for carrying her favourite stuffed animal or doll. Is she in secondary school? Then as she advances in skill, get her the Areva 250, which is perfect for confident riders who need the challenge of extra gears. It is basically a scaled down mountain bike built for the streets. Lightweight alloys and an InSync 24-inch suspension fork makes for a smooth riding experience to and from school. Has he or she yet to learn balancing on two wheels? Get the Pre Push Bike to give them the first taste of freedom. Ideal for rolling along the driveway, this starter bike has a lightweight Aluxx formed aluminium alloy frame and 12-inch wheels. Black and green may be the colours of choice for your would-be rider boy, while pink and white may be more her thing.